This plugin, using a standard educational interface called LTI, lets users logged in to your WordPress site navigate to our site to discuss and annotate documents without needing to log in separately here too (“Single Sign-On” or SSO). No content on your website will be altered, and no comments made on the NowComment site will appear on your site (unless you decide you want to embed a NowComment document on your site, which is unrelated to the user authentication discussed here). 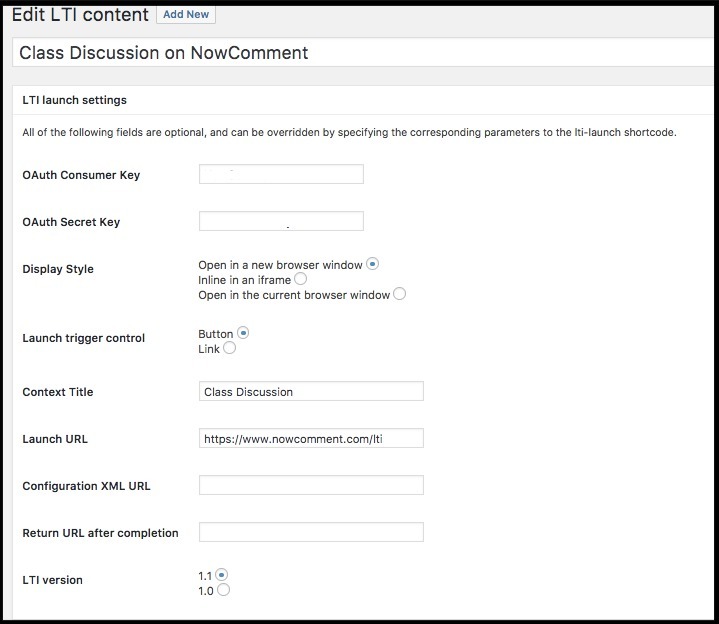 Go to https://nowcomment.com/lti_clients/new for an LTI key (WordPress calls it a “Consumer Key”) and “Secret” to use in step#10 below. Download our LTI-compatible consumer plugin from nowcomment.com/plugins/wordpress/wordpress-lti-consumer.zip. Unzip and save it to your system. Choose the plugin file from your computer and click “Install Now,” then activate the plugin; you should see the “LTI content” option in the WordPress site menu (expand if you have it collapsed). Click “LTI Content” to add new content (or “Edit” if you want to edit one you previously created). To add new content, click the “Add New” button. Specify the text to be used for the link to NowComment (you&apos;ll specify below if you want to use a text link or button link). In this example we used “Class Discussion on NowComment”. OAuth Consumer Key: Paste the key you chose in step#1. OAuth Secret Key: Paste the secret key we generated for you in step#1. Display Style: Choose either the new browser or current browser option (don&apos;t choose the iframe option). Launch trigger control: Choose either button or link. Context Title: If you want to create a new NowComment group for your site users to go to, enter the desired Group Name here (spelled exactly as it is on NowComment, case sensitive). If you leave it blank (the most flexible), each user will land on his/her own My Library homepage after clicking your link, and from there navigate wherever they want to go. Launch URL: If NowComment is running on our server use https://nowcomment.com/lti, but fill in another value if you&apos;re you have your own instance. Configuration XML URL: Leave this blank. Return URL after completion: Leave this blank. LTI version: Go with whatever the default value is. That&apos;s all for this configuration window, save it! Go back to the main LTI content area and mouse over the content you created via your configuration window data entry; you&apos;ll see a link to the shortcode that has been created for your content. Click it and copy the shortcode from the pop-up. Once you have created your link, paste the shortcode from your clipboard on as many pages of your site as will be helpful and easily found by your users; in a blog post, and/or in documentation, and/or in assignment descriptions, etc. In our example the link is in a post. That&apos;s all that should be required! Last updated July 12, 2017. Thanks to Beth Morgan at ConnectNC for testing our WordPress integration and contributing this write-up with screenshots.